THE CONDUCTOR WHO DOESN’T LIKE POWER. 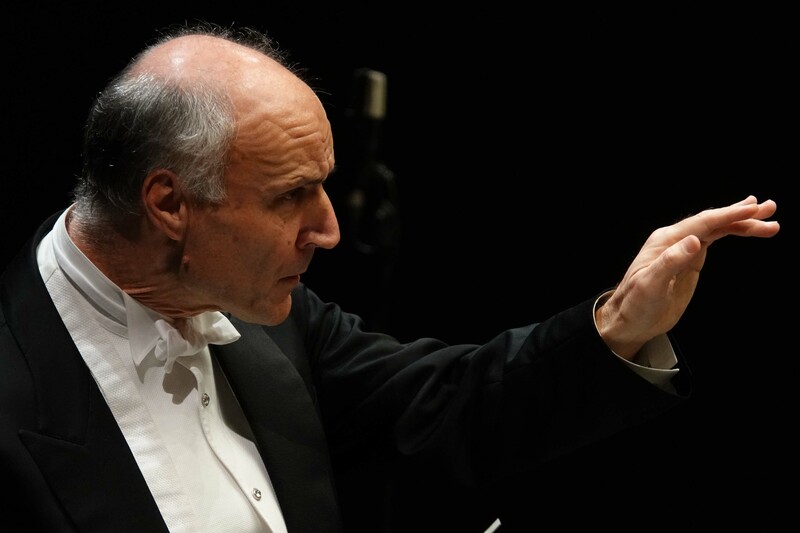 Oleg Caetani, one of the greatest conductors of his generation, works freelance and loves both symphonic and opera repertoire. Shostakovich’s music has a central role in his work, and Caetani has a particularly close relationship with laVerdi Orchestra. Forthcoming engagements include the Italian premiere at La Scala of Wayne McGregor’s ballet ‘Woolf Works’ with music composed by Max Richter. Your father Igor Markevitch was a Russian musician and composer, your mother from the Italian aristocratic family whose name you have taken. You have devoted your life to music. Did you discover your passion for music when you were very young? I began music when I was nine years old. For music that’s not so young, but when I was thirteen I decided to be a conductor, and that is quite young. I was lucky to have great teachers. It was very special that I studied with Franco Ferrara, a genius with an incredible instinct for music. He had a spectacular career as a young man, and at 18 years old he was the concert master of Maggio Musicale in Florence. Why did you then go and study in Russia for three years? The level of musical studies there was higher there than anywhere in the world. I was terribly attracted by that, and when I arrived in Moscow I fell in love with the culture. This was in Soviet Russia? Yes, in Brezhnev’s time. It was a wonderful experience as a student, because you had such a complete formation. I had ten different subjects, even including musicology, and also the story of the Soviet Union, the science of communism, the communist economy, subjects that they generally didn’t give to a foreign student from a capitalist country. You will laugh, but I felt very free. I was twenty and I really had the student life one wishes for. My teacher was Kirill Kondrashin, but when he left the Soviet Union I went to St. Petersburg and there I had the best teacher of my life, Ilya Mussin. He was a teacher of Gergiev and Temirkanov, the two great Russian conductors of today, and I really learned the technique of conducting with him. I was the first Italian to gain a diploma in conducting. What do you have to learn to be a conductor? Many things. You must play the piano really well and you must be able to read from the score at the piano, to reduce everything. You must know orchestration, harmony, contracts, and all those serious subjects. You also have to conduct a lot. 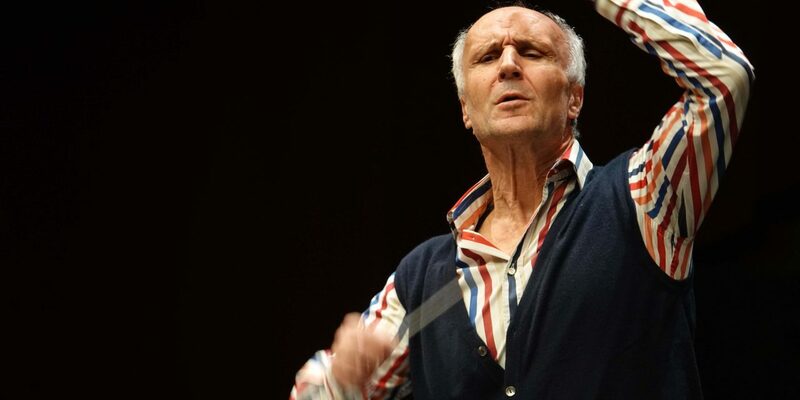 Oleg Caetani conducting in concert. Were the Russian orchestras very good? Extraordinary. We had incredible resources because we had a professional orchestra every day, both for opera and for symphonic music. In the conservatories in the West you don’t have an orchestra for opera, you learn opera after having finished your studies, but Tchaikovsky created an Opera Studio because he said one needs practice for the people who will play in the orchestra, for the singers (they can’t just come and sing their first operas in a real opera house), and for the conductors. As a young man you lived in the Communist world which is quite odd for an Italian aristocrat? I got my degree in St. Petersburg, and then I went to Germany as a pianist in an opera house in East Berlin. I was so struck by the communist system when I was in Russia, because everyone could study and everyone had a chance in life. That impressed me very much. When I came to East Germany it was occupied by the Soviet Union, so I changed my mind. I had learned in the Soviet Union that the East Germans were friends of the Soviet Union, but when I arrived there I noticed immediately that they hated the Russians and having to speak Russian, and they did not consider themselves free. Why did you go to live in Germany instead of Italy? I couldn’t find work in Italy, where I was born. In Germany I did the von Karajan international competition for conductors. That was a great encounter. Fantastic. Because Herbert von Karajan was an immense conductor, extraordinary both in opera and in symphonic concert, and contrary to what some people say he was a very nice and generous man. I loved to be with him. He gave his time to those of us who won the competition, and I went to his rehearsals and to his recording sessions. He had a great respect for Russia, and the fact that I had studied there was my visiting card. What did you learn from von Karajan? An enormous amount. I was very free in my conducting and he told me that if you choose a tempo you have to keep it. You can get a bit slower, a bit quicker, but then you have to come back to that one tempo for the movement of the symphony or for an aria. That was one very important thing. The other thing that I owe him is that he told me that as a conductor you are directing the orchestra as a captain, but you are not working with them, you are not part of them. They do their thing and you must only help where it’s necessary. How do you learn to be in command like that? His great example was from when he was young and learning to ride a horse. He was always working with the horse, until he understood that the horse jumps by itself and you just need to lead. That was the way he understood it, and that was very important. I wrote to him years later that I was so thankful for that, because it needed time to mature in me. I had other ideals, and Furtwängler and other conductors were more to my taste. How did you progress in Germany? I was young and very happy. After my first year in Germany when I won the von Karajan competition I went to Weimar, just for a concert. After that concert they asked me to be their chief conductor. After three months in Weimar the ministry of culture said I had to become an East German and take a new passport, but I said, “I can’t. I’m Italian,” so I stayed there for three years as the first official guest conductor. That was a really great time, and I learned a lot. I conducted a lot of opera, and the big works by Mahler that young conductors like. I was completely into music, night and day. Then I went to Frankfurt, because there was a position of first Kapellmeister in Frankfurt. Was there a great difference between the music of East and West Germany? Enormous. East Germany had the old German tradition, a very dark sound, but in West Germany you had woodwind players and many foreign musicians who had studied in France and America, while in East Germany there were only East Germans. West Germany is very Americanized, and the American influence is stronger than in Italy or France and I am thankful for the years there. But then I decided to be freelance, and that suddenly opened all sorts of possibilities. I conducted in Canada and in many other places for the first time, and was offered a concert in Melbourne, Australia. After I conducted there I became chief conductor and artistic director of the Melbourne Symphony Orchestra, and since then I have conducted a lot in South Asia, in Japan, and in China. I surely have two. One is Verdi and the other is Shostakovich, who died one year before I went to the Soviet Union, but is part of all our music history and means a great deal to me. I have conducted all his operas, and with the Verdi Orchestra in Milan I made the first recording in Italy of all the Shostakovich symphonies. I have conducted Shostakovich everywhere! Verdi gave me so much, he is so human. 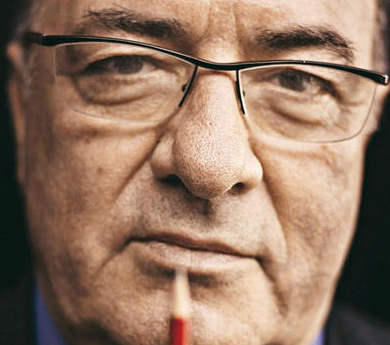 It’s incredible the evolution of this man who was born in the provinces, in Busseto, where there was almost no music. His first opera sounds like the local band in Busseto and the last operas sound like Debussy. You hear two bars and you know it’s Verdi. It can be early Verdi or late Verdi, but there he is, really universal. 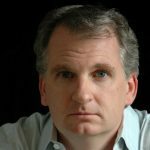 Verdi said that if you want to be modern you have to study the old masters, and he quotes Palestrina and Monteverdi, all of that is in his music. As a freelance conductor you have lived like a nomad. Do you like that? No, not at all. I am very conservative in my lifestyle and like to be in the same place. Now my second wife Susanna and I live in London with our daughter. My daughters from my first marriage come to London, and we all love London. It’s a great town for music, and for pop music is really the world capital. How did you come to marry an Italian woman? I was doing a benefit concert in Florence for my cousins and Susanna was a pianist and we met like that. After two days I said, “You are the love of my life.” We remain together and it’s so very romantic. And yet you live in London not Florence? It was my dream to live in London since when I was five years old and my parents had a tour to do and left me with a young couple in Brighton for three months. When they came to fetch me and asked how it was I said I wanted to come back, and I came back to England every summer and that’s when I learnt English. I realised my dream after I left Melbourne, but we also have an apartment in Florence where I go to concentrate and to prepare myself alone. It is not very easy to be a conductor. What is your work today? Every conductor has a different dream. Some dream of a fixed position and they do manage to get fixed positions. 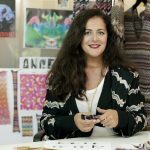 I always dreamt of being freelance, and I have realised that, for example working with Covent Garden and La Scala, both in opera and in concert. For me it’s very important not to specialize oneself. Do you prefer conducting a concert or an opera? Both, because it’s two different jobs. I don’t like it when in one year I do many more concerts or many more operas. I am careful to keep the balance between them. How much do you conduct? Sometimes every week, but sometimes three or four months pass without conducting, and that is wonderful – I can study, I can read. Coming up now is the ballet ‘Woolf Works’ at La Scala, inspired by the novels and life of Virginia Woolf. The last act describes her suicide in the waves and the letter she wrote to her husband. It’s a fascinating story because she was one of the first emancipated women and she wrote a lot about emancipation. Her husband was completely with her in this and extremely progressive for his time. It’s impressive. I would have never been able to follow the path of a wife with such a strong feeling of women’s lib. What is the music of ‘Woolf Works’ like? It is minimalist, written by the German composer Max Richter, who says it is post-minimalist, because minimalism hasn’t existed since the 60s. 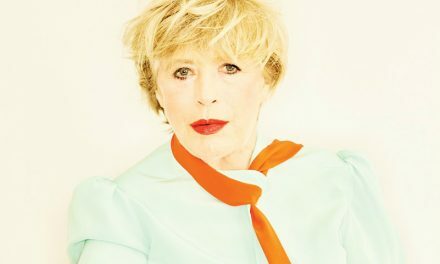 It is fascinating new tonal music, not as simple as Philip Glass. Richter grew up and studied in England. He’s a fan of Virginia Woolf, and he and the choreographer Wayne McGregor put this ballet together. It has been already played in London at Covent Garden, and at the beginning of April we have the La Scala premiere. For Italy, the great thing about this production is the return in her mid-fifties of the Italian prima ballerina Alessandra Ferri. For me, conducting minimalist music is really interesting. 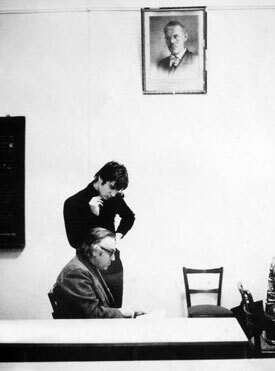 Oleg Caetani in Moscow with his teacher the conductor Kirill Kondrashin, who defected from the Soviet Union in December 1978. Oleg Caetani rehearsing with the Verdi Orchestra. 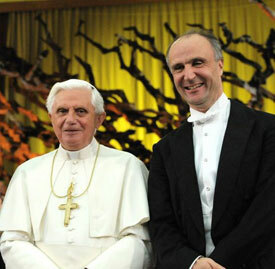 In April 2008, Oleg Caetani conducted the Verdi Orchestra in a concert presented by the Italian President to Pope Benedetto XVI in the Vatican which was recorded live for Eurovision TV. 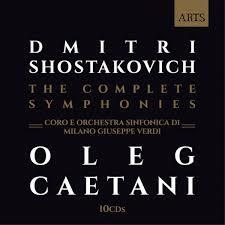 Oleg Caetani has recorded all the symphonies of Dmitri Shostakovich with Orchestra Sinfonica Di Milano Giuseppe Verdi. 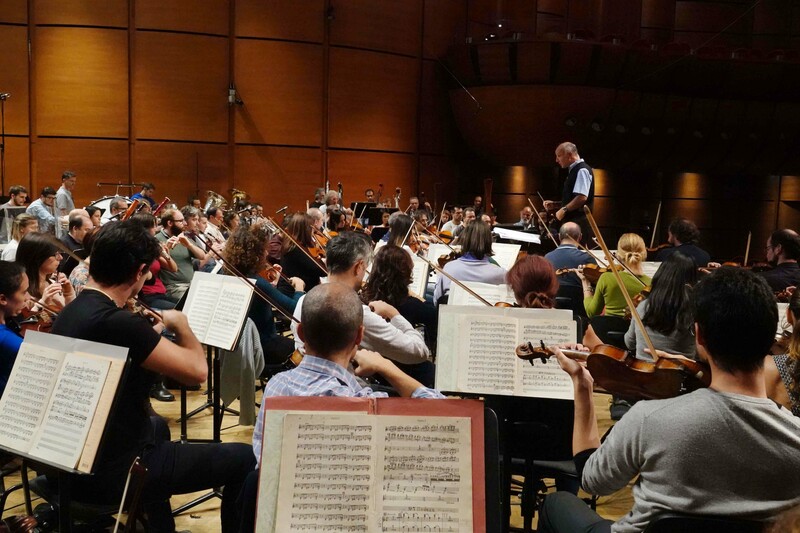 Oleg Caetani rehearsing with Maggio Musicale Fiorentino Orchestra. Oleg Caetani at La Scala. What are your future programs? Next year we do another ballet world premiere, again about women’s liberation. They will think it is my obsession, but it is not. I do obviously have things that I repeat, and I’m always asked to conduct Shostakovich’s symphonies and concertos. 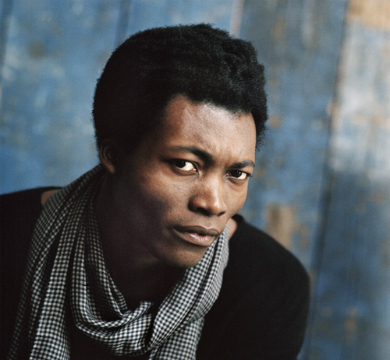 He wrote so much and I continue to conduct him all over Italy, from Trieste to Palermo. For a conductor is there a number one place, theatre or orchestra? I don’t think so. One fantastic orchestra is the Vienna Philharmonic because they play everything, modern music, contemporary music, Italian opera. I don’t see one opera house as the place to be, because so many secondary orchestras have become primary. Some give extraordinary results with their conductor. The Marrinsky Theatre orchestra were just now with concert with Gergiev and I was amazed. With him conducting they are better than anything else. 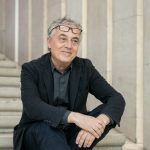 Do you like conducting in Italy? Yes. 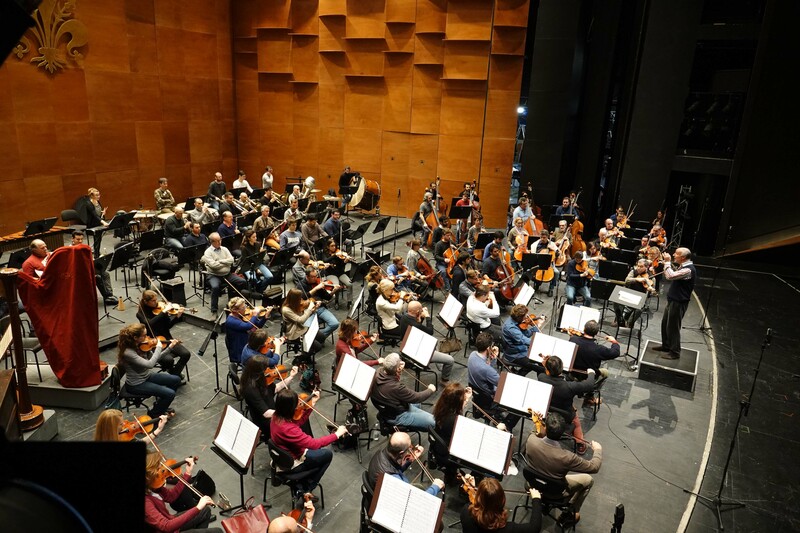 Italian orchestras are the only orchestras in West Europe that have their own sound. In north Italy you have brass players that come from the big bands of 80 people or so in the south who play works like the Rite of Spring. They are very enthusiastic, very strong, and they have one sound. And the string players are all from Italy, they have all studied in conservatory, and they also have their own sound, very brilliant, not dark, light but very immediate. Give a down beat without having prepared it very much and they come immediately. They are like a Ferrari, they react so quickly. Do you like to conduct in America? I have had nice experiences in opera. Americans work with opera in a very good and creative atmosphere, with great collaboration and a sense of team that you don’t expect in the Vatican of capitalism, but in opera making they are very united and cooperative. I find that the symphonic orchestras that are the flagship of America are always a bit the same; technically incredibly good, but then if you don’t tell them everything they don’t deliver. Is classical music and opera very much followed in the world of today? Everyone will tell you that classical music is dying, that we are living the swan song of classical music and I see it differently. I see that it’s happening in other places, and it has an enormous evolution in East Europe, and in Asia it’s incredible. It was only after the war that the first Japanese orchestras were created, and now there are opera houses everywhere and a huge public. When I conduct in Taipei for example it is full of young people and I feel like a pop star. If I conduct in Taiwan they come afterwards and ask for autographs on recordings that I didn’t even know that I have done because they are pirate recordings made by them! So, the enthusiasm is big there, and it is tired in West Europe and America, and I think that little by little it’s going to slowly die in England and in Europe because young people like rock, pop, techno, all that music. Look at the movies and the enormous success of ‘A Star Is Born’ with the famous pop singer Lady Gaga. This is the future here. Russia with Putin is incredible. They have built new opera houses and new concert halls and it’s evolving enormously. Putin loves music and in Russia culture is the heritage of communist time when culture was number one and the youth was brought to museums, to concerts and to opera. In Russia communism went on for nearly 70 years, and they built a culture in those years when the country was really poor, with real hunger and misery, where 80 percent couldn’t eat, and it has remained. Will it die in Italy? 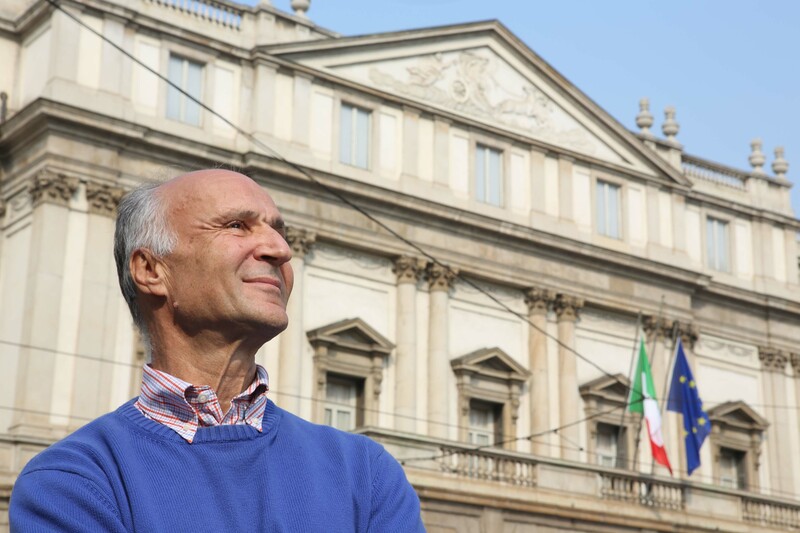 In Italy it is difficult because the government pays only for La Scala, and very little for the others, and for La Scala they pay less than the English government pays Covent Garden. The others manage to survive, but with sponsors and with new money, and I am an optimist that with a slow evolution classical music has a future in Italy. Are you a happy man to have devoted your life to music? Yes, I am very thankful, and I still have the same passion. That will never change. I am not a star, but I have enough to enable my family to live. Why should I have my own aeroplane? That’s in the past and finished, just as the recording industry of Deutsche Grammophon is finished. People don’t buy recordings anymore, but they go to concerts, because you can’t forget the great live evenings. 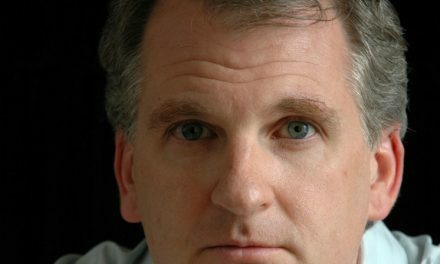 Wouldn’t like the power and influence of being a chief conductor, like Tony Pappano? No, not at all. I really cannot care less about power and business. I like music, and I like people. Are you a poet somehow? Yes, I think so. My wife says I am the only conductor who doesn’t like power.